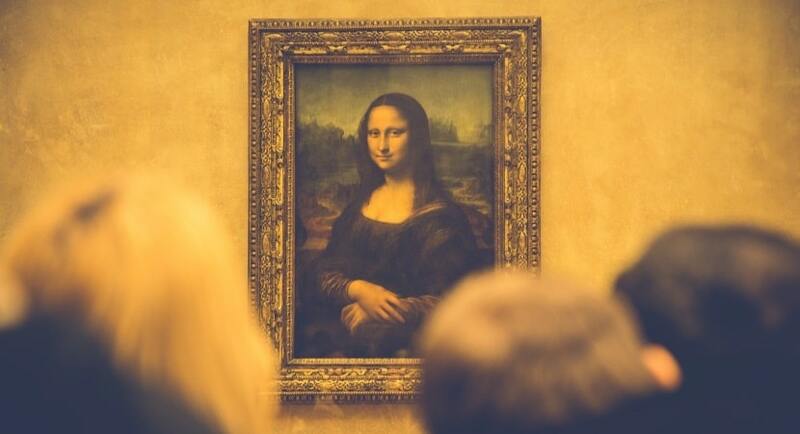 You may have often faced the challenge of losing or forgetting the password that you set when you first made a RAR file. Fortunately, you can download some perfectly legal WinRAR password remover software from the internet. These software help you recover your lost passcode, and they also reset a passcode or reassign your file to a new space. You can choose to remove the passcode after it’s been recovered. Features you must look out for in such software are the speed of recovery, user-friendliness, and cost. 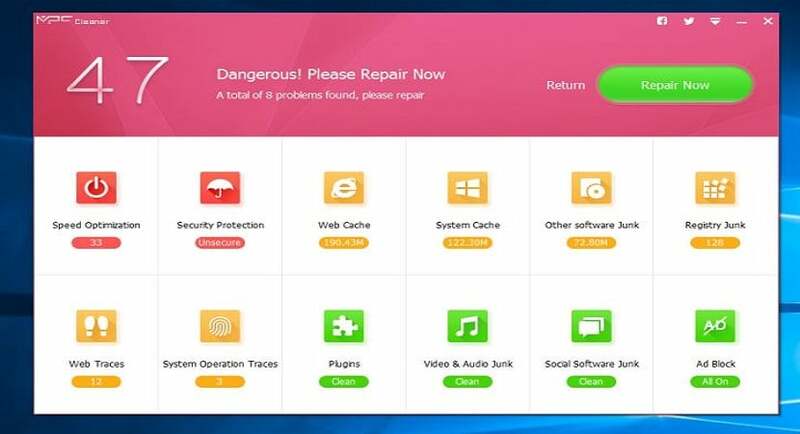 Professional products in this list cost around 20 USD so you must be careful to obtain the correct legal and virus free version. 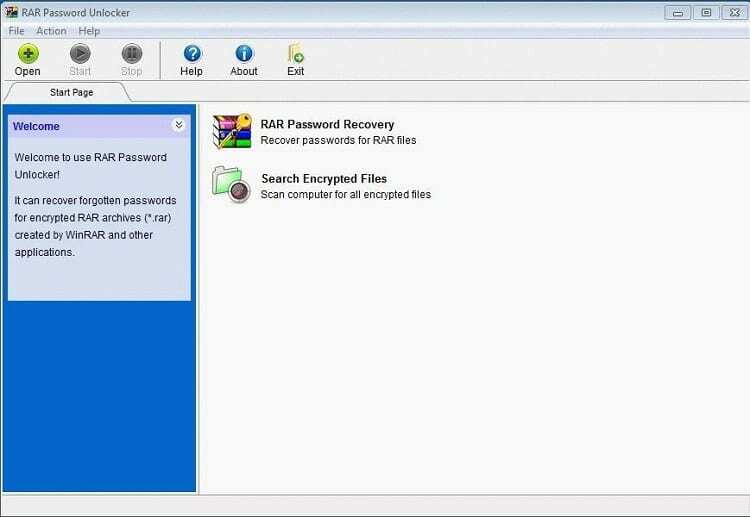 RAR Password Unlocker is available for Windows XP, Vista, Windows 7 and Windows 8 systems. Once you install Unlocker, the software lets you choose between three levels of code recovery: Dictionary, Brute Force and Brute Force with Mask. You can use the Dictionary mode when you know your passcode is fairly simple. The software goes through its directory and tries all passcode combinations to unlock your RAR file. Brute Force mode is for decidedly complex passwords, and it tries all possible sequences of passcodes to recover your file. Brute Force with Mask is a lot faster, as it lets you set conditions or parameters for the passcode, such as passcode length. This software lets you save your recovery procedure so that you don’t have to land back at step 1 if the software crashes. Speaking of which, one of the main disadvantages of Unlocker is that it may crash once in a while. Another issue is that the paid version, which you can obtain from the WinRAR password cracker website, is sort of costly, and the free trial isn’t very effective on complicated passcodes. If you’re fine with a software that takes time to process the recovery, then Unlocker is a great WinRAR password remover software. 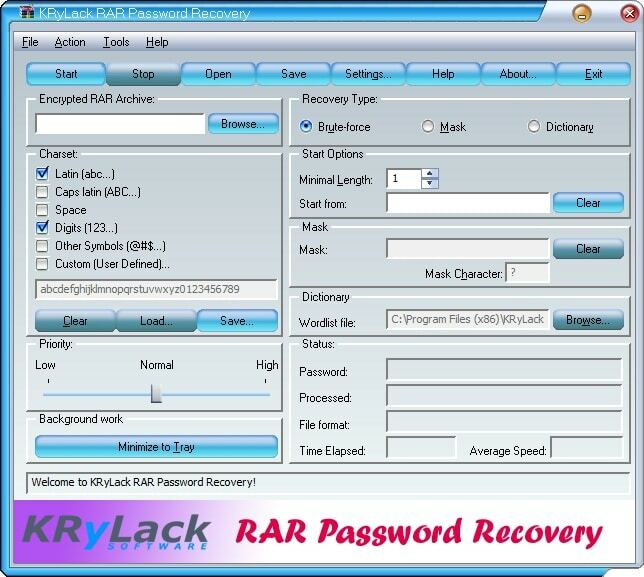 You are no doubt looking forward to a free and effective software, and luckily, KRylack RAR Password Recovery has a free download on their website. 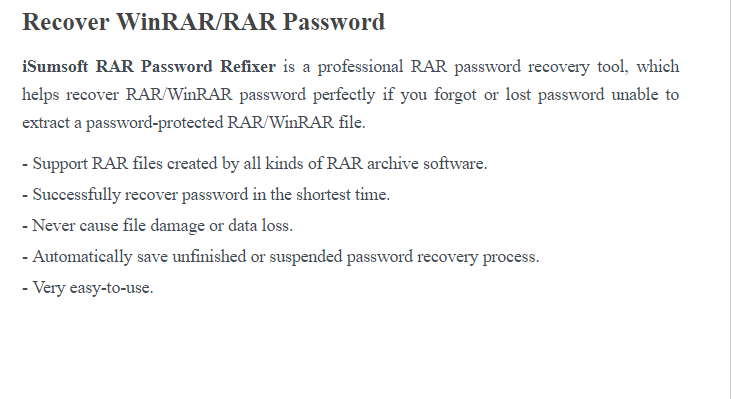 This WinRAR password remover software focuses it’s recovery process with the Brute Force technique. It is really quick, and has been voted as very user friendly. 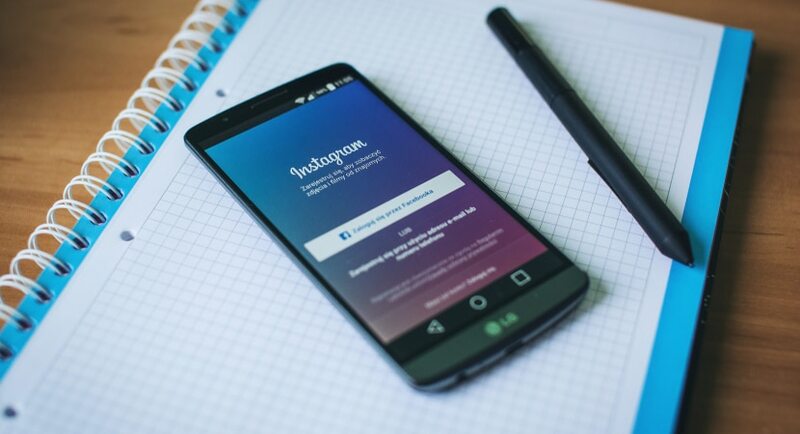 It also takes a while to recover complex passcodes, so you might want to consider investing in another software if this free product doesn’t work for you. iSumsoft RAR Password Refixer is one of the fastest and easy to use software in the market and is quite similar to Unlocker. Like Unlocker, it has a Brute Force attack, Brute Force mask and Dictionary attack, and additionally, it has Smart Attack. This WinRAR password remover software is designed for speedy recovery of passcode and lets you reset the code. Unfortunately, it’s just as expensive as Unlocker, but you can get a free trial as well as the paid professional version on the iSumsoft website. 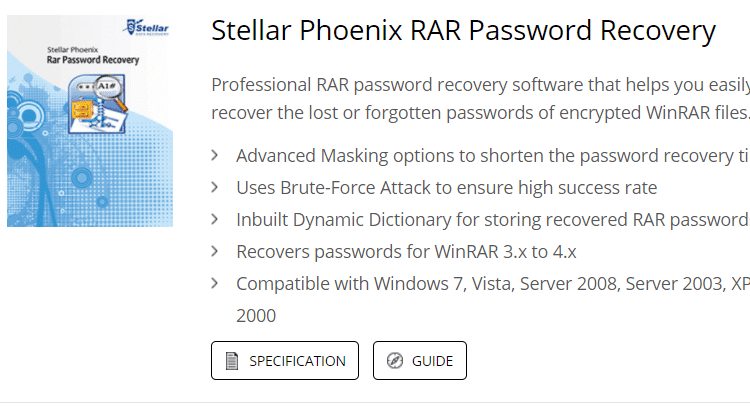 Stellar Phoenix Rar Password Recovery is a great product that is in the same league as Unlocker and KRylack. This software has a user friendly interface and is about as slow as Unlocker. It also tends to crash frequently. One major advantage of this WinRAR password remover is that it lets you set very distinct parameters for the passcode you’re expecting to recover. You will also be delighted to know that this software is free. This Stellar product is compatible with Windows 7, Windows Vista, 2003 and 2008. It has a Dynamic Dictionary mode that constantly adds new passcode sequences to its directory. While it’s Brute Force attack is effective, you’ll find that the Advanced Masking option makes the passcode recovery process super fast. This software lets you define character set, has a Dialog box that lets you know the recovery status. Also, it 0maintains a log report on the whole process. 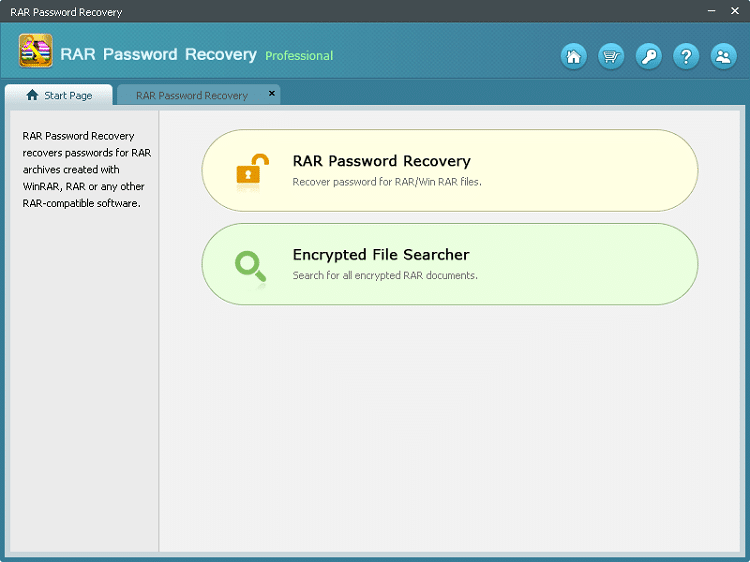 RAR Password Recovery Professional is a great WinRAR password remover option if you want to crack and unlock complicated passcodes for advanced systems. 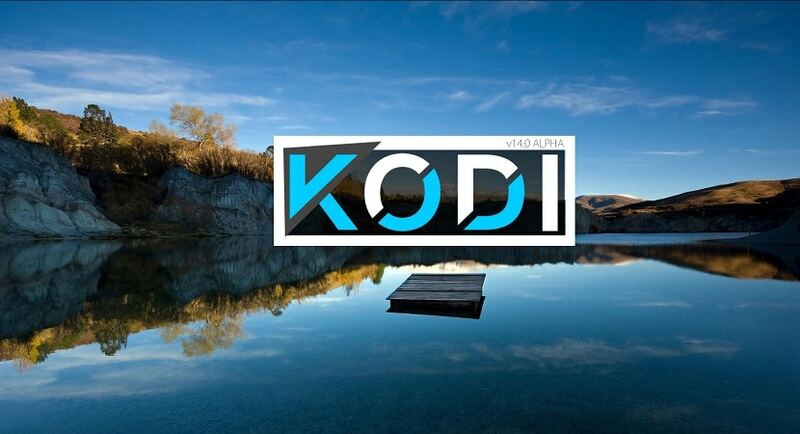 You’ll find that the developers designed this software for multi-core CPUs and NVIDIA GPU. Like the other options in this list, this software has the following modes. Dictionary, Brute Force and Brute Force with Masking. It is easy to understand, and has a perfect progress bar, where all steps are well defined. You can acquire the free trial and paid trial from the website recoverlostpassword.com. One con is that the free trial is not efficient when it comes to anything other than simple passcodes. 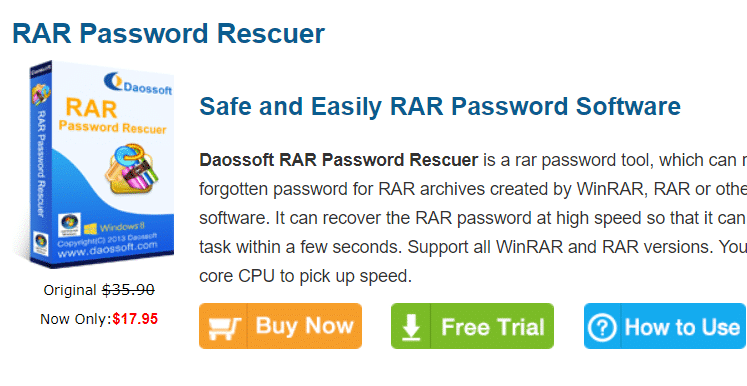 Daossoft RAR Password Rescuer has a very reliable WinRAR password remover, and like most options in this list, it simply recovers your original passcode and lets you reset it or dismiss the passcode altogether. One key feature of this software is that it lets you set a range for the Brute Force Attack. So, you can save time during the passcode recovery process. The range can be in terms of letters, symbols, numbers and character length. You’ll enjoy the easy to read design of the procedure and progress report. However, you might suffer with a loss of time as this software slows down. In order to obtain accurate passcode results. You can acquire a Daossoft free trial or a premium version is $ 18 on the website. You may be struggling with the technical process of recovering the pass code of a RAR file. Save yourself the frustration and invest in a virus-free product. Moreover, you can also try the free version of any of these software.